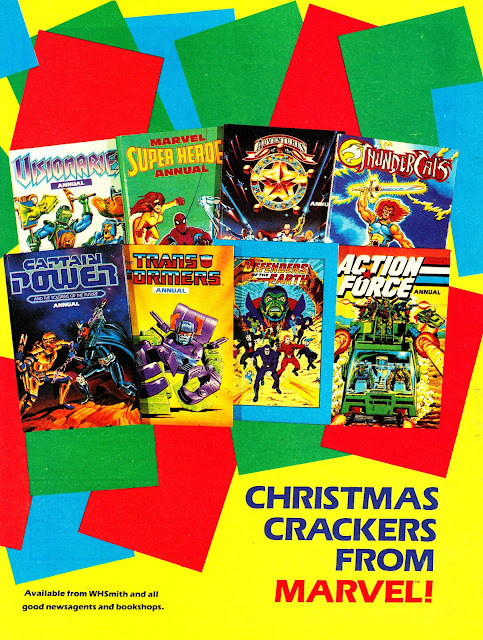 To get you in the Christmas spirit, here's a house ad for Marvel UK's range of ANNUALS for Christmas 1988. It's notable that only one actually features Marvel characters (a reprint of the one-shot SPIDER-MAN AND HIS AMAZING FRIENDS TV adaptation), the rest are all based on licensed properties. Spidey didn't even get his own solo book. CAPTAIN POWER AND THE SOLDIERS OF THE FUTURE was an all-British production based on the Mattel toys and TV show. Both became mired in controversy and barely made a dent in the UK. The interactive live-action TV show eventually turned-up, if memory serves, on WH Smith's LIFESTYLE TV channel (yup, the cards'n'mags retailer briefly dabbled in the satellite TV business). THE ADVENTURES OF THE GALAXY RANGERS has been covered in another post. Marvel launched a regular fortnightly based on the animated SF western, and swiftly merged it with THUNDERCATS. THUNDERCATS. Speak of the devil. Marvel's tie-in with the toys and animated series was a (far) greater success, despite the fact that the BBC didn't even air the whole series. ACTION FORCE and THE TRANSFORMERS. 'Nuff said. VISIONARIES was (yet) another Hasbro toy tie-in, which made comparatively little impact. The BBC aired the TV show and Marvel UK joined the associated merchandising push with a short-lived monthly (five issues), two stints as supporting feature in THE TRANSFORMERS and a one-shot special. DEFENDERS OF THE EARTH reprinted Marvel's Star Comics adaptation of the opening TV adventure. It's notable for having Stan Lee's name on the credits and also for explicitly identifying Flash Gordon's (soon to snuff-it) wife as Dale Arden, something the TV version conspicuously doesn't do. Marvel US pulled the plug on this one (based on their own animated TV show which teamed Flash with fellow King Feature strip stars The Phantom and Mandrake the Magician) after only four issues. Marvel UK reprinted the later two as a couple of specials, as well as serialising the strips in the pages of THE MARVEL BUMPER COMIC. I've enjoyed your blog and added a comment to an older post but I'm afraid you won't see it, so I'll try again here today. I really want to correspond with you about some questions I have about ROM Spaceknight in the U.K. Could you email me at A.ROM.Curator at gmail.com? Thanks! I'm actually pulling together a brief history of ROM at Marvel UK at the moment, for a future post. I'll drop you a note! Thanks for your kind words, sorry I missed your previous comment!